BANGOR — Tompco-Triton, Inc., of Bremerton, has been awarded a $19.5 million contract to renovate the insides of two aging bachelor enlisted quarters at Naval Base Kitsap-Bangor. The work at the submarine base includes complete renovations of two 70’s-era bachelors enlisted quarters located on the upper side of the submarine base near the gymnasium, exchange and galley. Both are two-story, hotel-style facilities, and house permanently stationed junior enlisted sailors and Marines. The aging buildings were constructed in 1977 and 1978, and renovation work of this magnitude has not been done since. An interior remake on one will bring it up to current seismic and energy standards, and will include new antiterrorism features. The interior on the other building will be totally reconfigured into suites, each containing multiple bedrooms that share dining space, a kitchenette and laundry. The new set-up is more efficient and saves money, according to a statement from the base. Design work is to begin very soon and the project will be done by spring 2014. Sustainable principles are being implemented. Tompco-Triton is a joint venture of two Bremerton construction companies, Tompco, Inc., and Triton Marine Construction Corp. The two firms have worked together on several projects previously and now are finishing up work on an exchange at Naval Air Station Whidbey Island. “So the timing couldn’t be better,” said Jeff Tompsoncq, Tompco chief executive officer. Tompco-Triton was one of three bidders on the contract. Tompson received word Monday that the combined company was the winning bidder. BELFAIR — After many months of being closed, a public employment office in Belfair was scheduled to reopen today, Monday, in a new location. 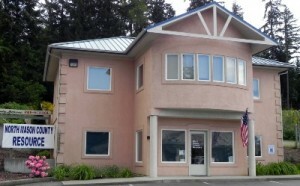 The WorkSource of Mason County office now is in larger quarters at the North Mason County Resource Center, located at 23554 NE Highway 3 in the Lincoln Center behind Peninsula Credit Union. The office offers job leads, training and counseling for persons seeking employment, and is open from 8:45 a.m. to 4:15 p.m. Mondays only. Those who need help on other days can visit www.go2worksource.com or go to the WorkSource offices in Bremerton or Shelton. WorkSource in Belfair operated briefly in space next to the North Mason Chamber of Commerce. The unemployment office closed in late July when the chamber moved and no longer had the room. While the new office is tiny, it serves North Mason residents who are unemployed who otherwise would have to travel long distances to Shelton or Bremerton. The unemployment rate in Mason County in August was 10.5 percent. To reach the new WorkSource office, call (360) 801-5651. It appears gas prices are on the way back up from the extremely modest dip we experienced over the summer. Today’s average price for a gallon of unleaded is $3.87, according to auto club AAA. That’s a whopping 12 cents higher than a month ago. A year ago, the price was just kissing the $3 mark. NEW YORK (AP) — Oil hovered around $80 per barrel Monday after new home sales dropped to a six-month low, adding to worries about energy demand in the slowing economy. The Commerce Department said that sales of new homes fell in August and are on pace for the worst year since the government began keeping records a half century ago. High unemployment and the possibility of another recession are keeping home buyers on the sidelines. The discouraging government report came as European leaders continued to debate the best way to resolve the months-old debt crisis that could drag down the regional economy. Investors are concerned that Europe’s problems could lead to another recession, which would cut demand for oil and gasoline. Demand for gasoline in the U.S. is already below year-ago levels. Benchmark oil rose 10 cents to $79.95 per barrel in midday trading in New York. Crude has traded between about $79 per barrel and $90 per barrel this month. Meanwhile Italian energy giant Eni said that Libya has resumed partial oil production for the first time since its civil war erupted in February. About 31,900 barrels of oil per day are being produced. Previously Libya exported about 1.5 million barrels of oil per day, which was less than 2 percent of the world’s demand. Some experts say it could take a year or more to get Libyan production back to that level. More Libyan exports could lead to lower prices for Brent crude as more and more oil is put on the global market, PFGBest analyst Phil Flynn said. That could eventually mean a drop in the price of gas, much of which is refined from Brent. In London, Brent crude rose 16 cents to $104.13 per barrel on Monday. In other energy trading, heating oil rose 1 cent to $2.8119 per gallon, gasoline futures rose a penny to $2.5319 per gallon and natural gas rose 8 cents to $3.785 per 1,000 cubic feet. BREMERTON — Habitat for Humanity of Kitsap County has gotten a big bargain on its purchase of six home sites in Bay Vista, the development replacing Westpark. Each of the six lots is worth $65,000, but Habitat was able to pick them up for $15,000, according to Kurt Wiest, executive director of the seller, the Bremerton Housing Authority. To make up the $50,000 difference for each lot, the housing authority drew on its $20 million Hope VI grant it received in 2008 from the U.S. Department of Housing and Urban Development. The housing authority has drawn on the grant to build much of Bay Vista. The Habitat homes will be in two triplexes near the corner of Oyster Bay and Russell roads. They will be surrounded by recently constructed affordable homes developed by the housing authority. Habitat leaders hope to have all six units completed and occupied by next year. Habitat helps low-income people build, then purchase homes they might not otherwise be able to afford. Ted Treanor, interim Habitat executive director, said the homes will be green. “Each home has greatly reduced energy consumption,” he said. A ground-breaking is at 10 a.m. Oct. 8. The push accelerates bigtime for a piece of the Boeing 737 action …. … Kitsap’s top leaders meeting this morning are determined to dress up and take a stroll down Boeing Lane to attract the eye of the 737 Max people. My story coming in a few hours. 1. The port and neighbors have more than 1,000 acres of zoned industrial land adjacent to our airport runway. 2. Kitsap County has a runway that can accommodate the 737 taking off and landing. 3. Because of the Puget Sound Naval Shipyard, Kitsap has a trained workforce. 4. The port has a rail line connecting the airport to the national railway grid. 5. The rail line connects to a deep-water port in Grays Harbor. 6. A highway connects Bremerton National Airport to Highway 16, 30 minutes from Interstate 5. 7. We are 50 minutes from downtown Seattle on the ferry and 10 more minutes to our airport. 8. Kitsap has been the home of one of the worlds great shipyards for 100 years. 9. Olympic College has an outstanding apprentice training program. 10. Kitsap is in the district of Congressman Norm Dicks , a great supporter of The Boeing Company. Twenty-three metal floor medallions designed by local high-school art students will be unveiled Saturday, Oct. 1, at the center court at Kitsap Mall. The unveiling from noon to 2 p.m. will feature an appearance by James Kelsey of Port Orchard, who created the medallions based on students’ designs. Mall organizers invited local high-school teachers to have their students submits drawings of a Pacific Northwest representation of nature. Hundreds of designs were submitted from South Kitsap, Bainbridge, Kingston and Port Townsend high schools.